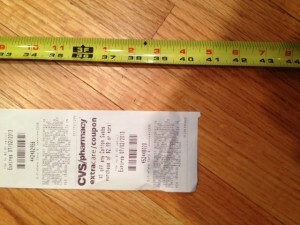 CVS, Please Stop the Paper Waste: My Receipt Was 40 Inches Long! I recently picked up a few items at our local drugstore. 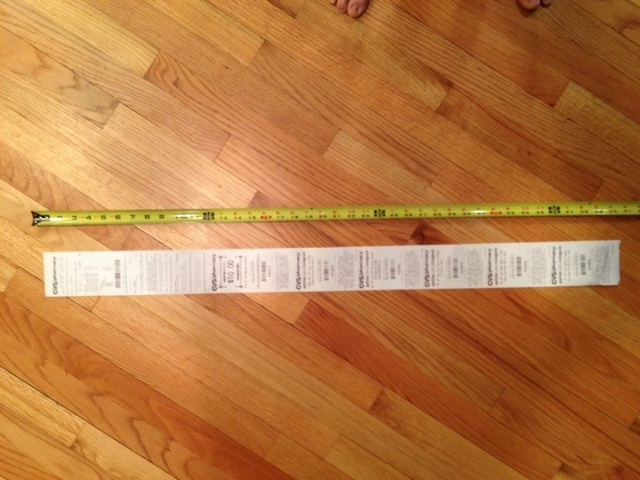 The cashier asked if I had my CVS card to scan? I handed it over, zap. Did I want to give $1.00 to ALS? Not today, thanks. Would I like to update my email information to receive more discounts. No, thank you. Thinking: I haven’t changed my email info since the early ’90s. AOL or die! I paid in cash, and received my change along with a receipt that was longer than my leg. 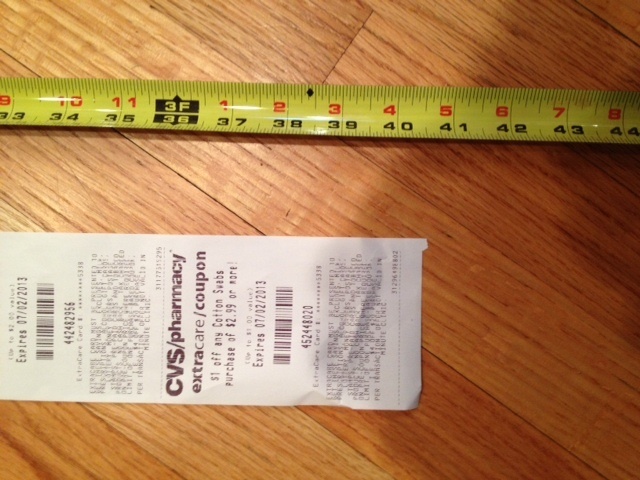 Evidently, this is part of a marketing strategy for CVS — bang a bunch of discount coupons on the end of every receipt handed out. Do you know what happened to mine? Then it will go in the recycling bin. 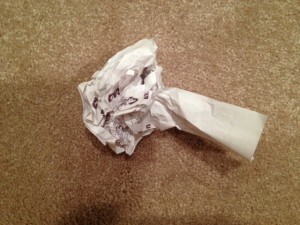 We are living in a time when enlightened individuals and progressive businesses are attempting to reduce paper waste. Folks bring reusable bags to the market. My publisher, Macmillan, no longer prints catalogs — they’ve gone digital. Those are two small examples. And then we have the insane, irresponsible receipts at CVS. The average American office worker uses about 500 disposable cups every year. Every year, Americans throw away enough paper and plastic cups, forks, and spoons to circle the equator 300 times. After Ireland created a 15-cent charge per plastic bag in 2002, bag consumption dropped by 90 percent. In 2008, the average person in Ireland used 27 plastic bags, while the average person in Britain used 220. The program has raised millions of euros in revenue. The state of California spends about 25 million dollars sending plastic bags to landfill each year, and another 8.5 million dollars to remove littered bags from streets. Every year, Americans use approximately 102.1 billion plastic bags, creating tons of landfill waste. The average American uses about the equivalent of one 100-foot-tall Douglas fir tree in paper and wood products each year. The average office worker in the US uses 10,000 sheets of copy paper each year. That’s four million tons of copy paper used annually. Office workers in the US generate approximately two pounds of paper and paperboard products every day. Between Thanksgiving and New Year’s, an extra million tons of waste is generated each week. 38,000 miles of ribbon are thrown away each year, enough to tie a bow around the Earth. In 2008, Paper and paperboard made up 31% of municipal waste. In 2008, the average amount of waste generated by each person in America per day was 4.5 pounds. 1.1 pounds of that was recycled, and .4 pounds, including yard waste, was sent to composting. In total, 24.3% of waste was recycled, 8.9% was composted, and 66.8% was sent to a landfill or incinerated. Asia has surpassed Western Europe in paper consumption and will soon surpass the United States. replaced by packaging as the single largest category of paper use at 41% of all paper used. The paperless office, once predicted as a result of information technology (IT), has not transpired. Industry analysts estimate that 95% of business information is still stored on paper. Recycling 54 KG of newspaper will save one tree. Paper manufacturing is the 3rd largest user of fossil fuels worldwide. Paper manufacturing is the largest industrial user of water per pound of finished product. The average American uses more than 748 pounds of paper per year. The average daily web user prints 28 pages daily. 115 billion sheets of paper are used annually for personal computers. 700 pounds of paper are consumed by the average American each year. 10,000 trees are cut down annually in China to make holiday cards. 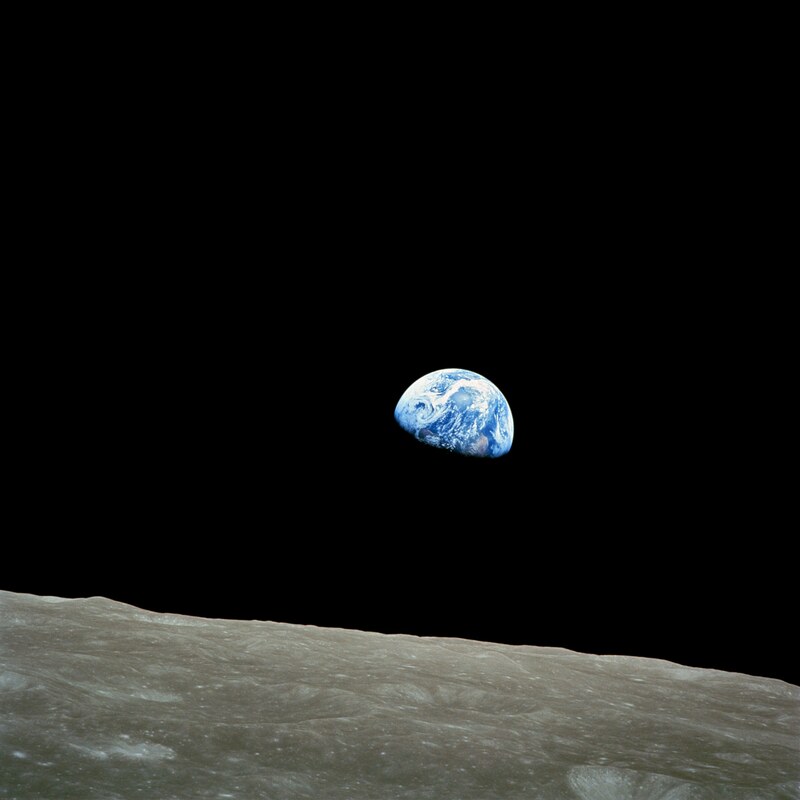 It’s a beautiful planet. And our only one.